this charger just do one charging voltage. 9. 100% full load burn-in test. 1. 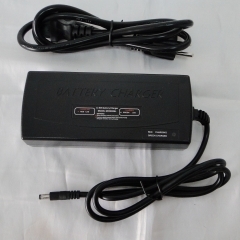 Check if your local main supply confirms to charger's input voltage 110 or 220V. Please set to your correct local compatible vlotage. 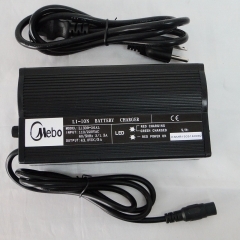 110V is compatible for 100-120V countries, 220V is compatible for 220-240V countries. This is very important to avoid charger damage. 2. Connect the charging plug or the DC output cord to battery terminals. has a Fuse instead of Relay for Reverse Polarity Protection, it has output once AC power on. 60W ABS 24V LiFePO4/Lithium Ion Ebike kit soc..
180W Alloy 24V LiFePO4/Lithium Ion Ebike kit ..
240W Alloy 36V LiFePO4/Lithium Ion Ebike kit ..
300W Alloy 48V LiFePO4/Lithium Ion Ebike kit ..
90W ABS 36V LiFePO4/Lithium Ion Ebike kit soc..